On November 26, 2018, at the age of 101, our beloved mother, mother-in-law, grandmother, and great-grandmother Helen Burness left this life to be with those who have passed before her. She was born in New Haven on March 16, 1917. Helen was the embodiment of all that was good and gracious. She never had an unkind word to say about anyone and she embraced the good that we all have within us. A tireless peace keeper, she was a wonderful person to know and love. 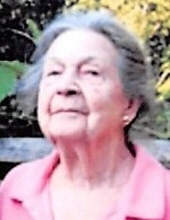 Helen was predeceased by her husband, Louis; her daughter, Patricia; her son-in-law, Oscar Krischtschun; her parents, Frank and Lillie Manacchio; her brother, Bernard Zambrano; sisters, Mae Hussey, Phyllis Squeglia, Carmel Cote, Laura Rudolph, and Lucille Wnek. Survivors include daughters, Barbara Wolff and her husband Perry, Carole Pleines and her husband Richard, Sharon Krischtschun and her partner Joseph Pacelli, and Kathy Burness and her husband Stephen Duffy; grandchildren, Deborah Mallozzi, Kenneth Krischtschun, Pamela Krischtschun, Richard Pleines, Joseph Pleines, Susan Smith, Ryan Duffy, Stephen Duffy, Elizabeth Apperson, John Daley, Matthew Daley, and Helene Daley. She is also survived by many great-grandchildren, one great-great grandchild, nieces and nephews, and longtime good friends Frank and Anne Balzano. Helen was a Past Matron of the Myrtle Chapter #6 of the Order of the Eastern Star. Friends are invited to visit with Helen's family on Thursday, November 29 from 10:00 -11:00 AM in Beecher & Bennett Funeral Home, 2300 Whitney Ave., Hamden. Her Funeral Service will begin in the funeral home at 11:00 AM. Burial will follow in Centerville Cemetery, Hamden. To send flowers or a remembrance gift to the family of Helen Burness, please visit our Tribute Store. "Email Address" would like to share the life celebration of Helen Burness. Click on the "link" to go to share a favorite memory or leave a condolence message for the family.